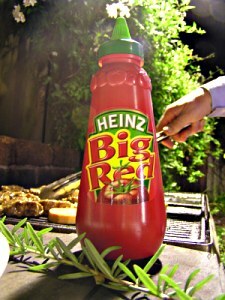 Just finished watching a documentary on Discovery Channel about Heinz Ketchup, was fascinating! Before I go any further though, I want to clear up the naming issue. Being from Australia I always called it tomato sauce instead of ketchup, but in actual fact there is a difference: ketchup has more vinegar and spices than squeezable tomato sauce. In North America the term "tomato sauce" refers to sauces for pasta rather than ketchup, but I think I'll still call it tomato sauce. I'm stubborn and set in my ways. In the Heinz factory in The Netherlands the recipe for their tomato sauce is a well guarded secret. Over one million bottles a day are sold to Asia and Europe. The tomatoes have spoken. Wow, that was a terrible joke, even by my standards.